The Armenian Genocide Museum вЂ“ Institute has published diplomatic documents of the Historical-diplomatic archive of the Ministry of Foreign Affairs of Italy on the Armenian Question 1913-1923 from the series of вЂњArmenian Genocide: diplomatic documentsвЂќ being published by AGMI. The only Great Power of those times is Italy in whichвЂ™s archives preserved documents on the Armenian question and the Armenian Genocide till the last times were almost unknown to the Armenian society. At the beginning of 2005 by the intercession of the Embassy of Armenia in Italy, weвЂ™ve got permission for researching these documents in the Historical Diplomatic Archive of the Ministry of foreign affairs of Italy. The researches showed that the documents concerning to the Armenian people are deposited under the name Armenia. This fact is very interesting, as we see that the territory on which were living Armenians in the Ottoman Empire was comprehended as Armenia. Paris, France--On December 18th, 2009, Dr. Hayk Demoyan, the Director of Armenian Genocide Museum & Institute at Alex Manukyan Cultural Center lecturing on the current developments in the Armenian-Turkish relations, focusing on a new dynamics and challenges. During the meeting, Dr. Demoyan touched upon the new progress being made within Armenian-Turkish relations today, the aims of Armenian side, the new conceptual approaches to the focal issues of genocide recognition, as well as the necessity to develop a general Armenian approach. He also briefed about the present activities and future plans of the AGMI. The representatives of Armenian organizations and the Paris Armenian community were present at the event. Dr. Demoyan also engaged the audience in a brief question and answer session at the end of the discussion. On December 10, the presentation of the graphical novel вЂњPrior to the Auction of SoulsвЂќ novel by Tigran Mangasaryan, sponsored by Sossi Ghazarian took place in the Armenian Genocide Museum-InstituteвЂ™s hall named after Komitas. The book is written on the basis of the eyewitness of Armenian genocide Aurora MardiganyanвЂ™s memoirs titled as вЂњRavished ArmeniaвЂќ, which was first published in 1918 in New York in English. In one of the first documentary memoirs of the eyewitness of Armenian genocide, the author, survivor of the Genocide Arshaluys (Aurora) Mardiganyan from Chmshkatsag gave a detailed account of the terrible experiences she endured during the genocide. In 1918 in California, at вЂњMetro Goldwin MayerвЂќ studio, director Oscar Apfel made a silent film вЂњAuction of SoulsвЂќ, which actually became the first genocide movie, based on Aurora MardiganyanвЂ™s memoirs. The premiere of the вЂњAuction of SoulsвЂќ was held on February 16, 1919, in Plaza Hotel, New York under the auspices of Oliver Harriman and George Vanderbilt, members of American Committee for Armenian and Syrian Relief. Tigran MangasaryanвЂ™s graphical novel was published in connection with the 90th anniversary of the shooting of вЂњAuction of SoulsвЂќ. AGMI published memories of Swedish missionary Alma Johansson, eyewitness of the Armenian Genocide, with the Armenian, English and Russian texts in one volume. Swedish missionary Alma Johansson was born in 1880. In 1901, as an activist of Swedish women missionary movement she left for Western Armenia to provide humanitarian assistance to Armenians who suffered Hamidian massacres. In 1910-1915 Johansson was in the city of Mush where she was involved in care of Armenian orphans in the orphanage of German Deutscher Hulfsbund missionary organization. From 1923 to 1941 Johansson was involved in relief work in Salonika, helping Armenian refugees sheltered in Greece. With the efforts of Johansson a manufacture was founded in Salonika. Alma Johansson was an eyewitness of the Armenian Genocide; her eyewitness testimonies were published in two small volumes in Swedish вЂ“ вЂњA People in ExileвЂќ (1930) and вЂњThe Life of RefugeesвЂќ (1931). Both in these volumes and her reports to German and American diplomats Johansson testifies about the massacre and deportation of Armenians committed by Turkish authorities of the Ottoman Empire and the poor condition of refugees who survived the massacres. Alma Johansson died in Stockholm in 1974. A high-ranking Vatican official has emphasized that the Holy See regards the Armenian Genocide as a fact. "The Armenian Genocide is a fact. The VaticanвЂ™s stance on this issue was stated during a visit to Armenia by [late Pope] John Paul II. 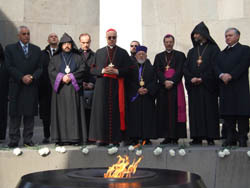 The pope attended the Armenian Genocide memorial and did use the term Genocide, although this did not please Turkey," said Cardinal Walter Kasper, President of the Pontifical Council for Promoting Christian Unity. The cardinalвЂ™s remarks came ahead of yesterdayвЂ™s meeting between Pope Benedict XVI and a group of visiting Armenian clerics led by Catholicos of Cilicia Aram I, the leader of the Armenian Apostolic Church in Lebanon, TodayвЂ™s Zaman reports. "Genocide is not an allegation, but is a reality. This is not an issue of term. It is a historical fact with a lot of victims and this memory needs to be healed. I donвЂ™t know what the Vatican can do to ease Turkey-Armenia relations. But this is also an important case for peace in the Middle East. First of all, the Catholic Church sides with the victims. This is the most important principle for us while determining our manners," the Cardinal said. The representatives of the Ministry of Employment of Sweden visited the Tsisernakaberd Memorial Complex. The guests put a wreath at the memorial of the Armenian Genocide on behalf of the Swedish Government. The delegation of Sweden took a tour of the Armenian Genocide Museum. Recently, the Armenian Genocide Museum-InstituteвЂ™s efforts towards collection of new data on the Armenian genocide have experienced great success with the enrichment of AGMIвЂ™s collection of documentary photographs. The most recent discovery is a photo testifying of the Armenian Genocide and in particular the massacres of the Armenian population in the region of Mush. The photograph has been acquired by the AGMI and was captured by Russian soldiers on the Caucasus front in 1915. It portrays the remains of the Armenian villagers who were burnt alive during the massacres of Mush. The District Court of Winterthur, Switzerland, imposed a fine on three Turks for denial of the Armenian Genocide. Ali Mercan was obliged to pay 4500 Swiss francs. Hasan Kemali and Ethem Kayali will have to pay 3600 Swiss francs each. On 30 June, 2007, the three men joined a Turkish nationalist meeting organized by Dogu Perincek, the leader of Turkish Workers' Party. During the meeting they declared that the massacre of the Armenians was not Genocide, but an international lie orchestrated by France, U.K and Russian tsarists. The president of Russian Federation Dmitri Medvedev arrived to Yerevan on an official visit. The president of RF visited the Tsisernakaberd Memorial Complex. Mr. Medvedev put flowers at the memorial of the Armenian Genocide victims and planted a fir at the Memory Alley. Then the president and the Russian delegation took a tour of the Armenian Genocide Museum, where Mr. President left a note in the Commemoration Book: вЂњArmenian Genocide Museum and memorial are the evidences of awful tragedy of 20th century. In the same time it reminds that life is the most important value that given for safe to civilized nationsвЂќ. Hayk Demoyan awarded Dmiry Medvedev with a вЂњGold MedalвЂќ of the AGMI. The President of Russia planted a tree in memory of the victims of the 1915 genocide. The ceremony of blessing of the memorial plaque for the establishment of вЂњThe Monument of GratitudeвЂќ took part today on Admiral Isakov avenue. The monument of gratitude to be built in Yerevan will symbolize the gratefulness of the Armenian nation to the Arab people for their humane and dignified position, thanks to which many Armenians survived after the Genocide. Catholicos of all Armenians His Holiness Garegin II and the representatives of the Christian churches who arrived Armenia for the holiday of blessing of the Holly chrism at the Holy See, today visited Armenian Genocide memorial and museum to join to the ceremony of commemoration. The representatives of the delegations put flowers at the memorial of the Armenian Genocide and made a tour in the Genocide Museum. 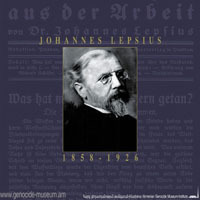 On AGMIвЂ™s initiative international conference on September 8, 2008 dedicated to the 150th anniversary of the German missionary Johannes Lepsius (1858-1926) was hold. Johannes Lepsius was the long-life friend and supporter of the Armenian nation. After the massive Armenian massacres (1894-1896) he permanently did his best to prevent new ones and to help the survivors of the Armenian Genocide. He founded hospitals, orphanages, schools and manufactures for the survivors and refugees of the genocide. In 1912-1914 Lepsius took part in working out of the Armenian reforms. In 1919 he published вЂњGermany and Armenia 1914-1918вЂќ (Deutschland und Armenien 1914-1918), the collection of German diplomatic documents regarding the Armenian Cause and the Armenian Genocide. At the conference dedicated to the German missionary Babken Harutyunyan (YSU), Ashot Hayruni (YSU), Artem Ohanjanyan (Vienna), Rubina Peroomian (University of California, USA), Andreas Bauman (Christianity Hilfsbund in Orient, Germany), Tilman Allert (Germany), Manfred Ashke (Germany) made speeches. Today a temporary exhibition called вЂњArmenian Sport in the Ottoman EmpireвЂќ at the Armenian Genocide Museum was opened. A total of about 70 photos, documents, newspapers and magazines will be on show. They reflect the history of Armenian sports clubs and football teams in the Ottoman Empire until 1915. Armenian sports clubs and sportsmen played an important role in the development of sport in the Ottoman Empire. The number of the Armenian sports clubs in the Ottoman Empire reached 100. In 1911-1914, four Armenian Olympic Games were held in Constantinople. From 1911 to 1914, Shavarsh Qrisyan published the Marmnamarz sports magazine, the first sports periodical in the Ottoman Empire. Today, within the framework of the third Pan Armenian cultural festival вЂњOne nation, one cultureвЂќ, which is hold in August 17-23, the participants and organizers of the festival visited the Tsisernakaberd Memorial Complex. The guests put flowers at the memorial of the Armenian Genocide and took a tour of the Armenian Genocide Museum. Representatives of the delegation also planted a fir at the Memory Alley in the memory of the Genocide victims. The chief aim of the festival is to gather the creative potential both from Armenia and from Diaspora. The executive director of вЂњOne nation, one cultureвЂќ foundation Tamar Pokhosyan thinks that this festival is politically, nationally and culturally great event which has been able to achieve its aim since 1999. By the way, in the festival cultural delegacies from Armenia and other 16 countries took part. The greatest delegacy is from Russian Federation, then Georgia and Iran, cultural groups from NKR, Turkey, Lebanon, Kazakhstan, Belarus, Macedonia, Syria, Holland, Hungary, Serbia, Bulgaria, and USA. The festival вЂњOne nation, one cultureвЂќ is organized under the high favor of the RA President Serzh Sargsyan, the Ministry of Culture of RA, the Foreign Affairs Ministry of RA and вЂњOne nation, one cultureвЂќ foundation. Moscow: on August 6th of 2008, 83 years old Yuri Barseghov past away. Barseghov was a prominent researcher, famous international law expert, a former diplomat and the author of various Armenian Genocide related books and documents. Yuri Barseghov was born in Tiflis on March 7th, 1925. In 1950, he graduated from the Khsm Akn International Relations State Institute. He earned a PHD in law and became a professor of International Law. In addition, Barseghov was the author of over 300 articles on international relations-diplomacy and international law. In Moscow, he became the director of the Armenian Institute on International law and politics. 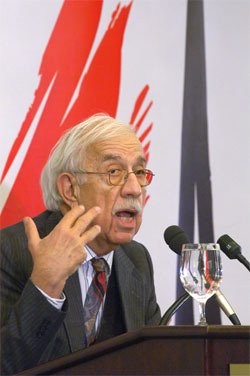 BarseghovвЂ™s famous 3 volume compilation published in 2005 is titled, вЂњThe Armenian Genocide: Turkish responsibility and the obligations of the International community. Documents and CommentsвЂќ. Furthermore, BarseghovвЂ™s most recent publication was a compilation of documents on the conflict of Nagorno-Kharapagh published earlier this year (2008). During the time of his death, Barseghov was working on the second edition of this compilation which included analytical documents and an examination of the conflict, but due to his unfortunate demise the edition never saw the light of day. 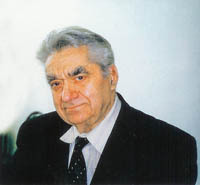 In 2000, Barseghov was awarded with the Mekhitar Kosh medallion and in 2008 he won the presidential prize for Armenian Genocide Research. The Armenian Genocide Museum-Institute held the memorial ceremony in honor of the Norwegian missionary Bodil Katerina BiГёrn. At attendance was a delegation from Norway, including members of the BiГёrn family and the mayor of the Norwegian city of KragerГё, Mr. KГҐre Preben Hegland. During his speech in honor of Bodil BiГёrn, Mr. Hegland referred to the Armenian Genocide of 1915 and condemned its perpetrators and deniers by stating: вЂњThe City Hall of KragerГё has acknowledged the atrocities and crimes committed by the Ottoman Empire against the Armenians as Genocide. The evidence of the genocide was witnessed and documented by many including Bodil BiГёrn. I hereby, encourage the Norwegian government and all of its institutions to recognize and condemn the Armenian Genocide of 1915вЂќ. As such, the famous Norwegian Missionary Bodil Katerina BiГёrn was born in the city of KragerГё, South of Norway. In fact, the exquisite building set at the center of the city where the City Hall of KragerГё is based in, was the household of Heinrich BiГёrn, the father of Bodil and a rich proprietor. Now, there is a memorial stone-plaque dedicated to Bodil Katerina BiГёrn in front of the mayorвЂ™s office. The memorial was made by the efforts of the Armenian community of Aleppo. 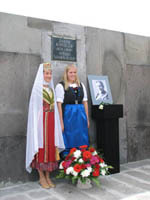 On July 22nd of 2008, the Armenian Genocide Museum-Institute held the memorial plaque dedication ceremony in honor of the famous Norwegian missionary Bodil BiГёrn. The ceremony began at the AGMIвЂ™s Gomidas Hall with the presentation of the film вЂњThey call me motherвЂќ; a featured movie at the 2008 вЂњGolden ApricotвЂќ Film Festival. Attending the ceremony were the members of Bodil BiГёrnвЂ™s family traveling from Norway to Armenia. The ceremony also featured the presentation of a photo album of Eastern Armenia captured by Bodil BiГёrn. This greatly preserved album included photos of the Armenian Genocide and images of life after the horrible events of 1915. Moreover, the presentation introduced letters, journals and other testimonial documents that authenticate the genocide. On this occasion, the directing board of the AGMI awarded Jussi BiГёrn, the grandson of Bodil BiГёrn, with a certificate of acknowledgment and a silver medal. Over the last year the Armenian Genocide Museum and Institute has embarked on the undertaking of collecting rare artifacts and historical documents testifying the Armenian genocide and the Armenian existence in the Ottoman Empire. This collection campaign has been successful; as such discoveries not only enrich the MuseumвЂ™s present collection of priceless material but also remain indispensable in their faculty of re-affirming and encapsulating Armenian history both in beauty and in truth. A few days ago, the museum received a magnificent donation from Anahit Asylian Syrian born American Armenian. On June 9, this petition text was published in the second largest newspaper in Sweden (in Swedish and available in several languages). In connection to the voting in the Swedish Parliament on June 11, 2008, regarding the four motions calling upon Sweden to recognize the 1915 Genocide in Ottoman Turkey. The Foreign Committee has advised rejecting the motions on the basis of "disagreement among researchers" and "the need of further research". 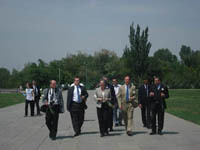 The delegation of U.S. House of Representatives under the head of U.S. Congressman Adam Schiff visited Tsisernakaberd Memorial Complex. There were also other congressmen of U.S.H. of Representatives in the delegation. Guests put flowers to the memorial to the Armenian Genocide victims. Then U.S. delegation, accompanied by the Director of the AGMI Hayk Demoyan, visited the Armenian Genocide Museum, where Mr. Demoyan introduced them with the history of the Armenian Genocide. The Congressman Adam Schiff left a note in the Commemoration Book: "I was very moved to see the images of those who survived and those who were lost, and to hear the words of the son of a survivor who stood by the eternal flame and told us of his eternal loss. We will always remember!" The members of the delegation also planted a fir at the Memory Alley. In the frameworks "Summer Courses 2008" of the Mesrop Centre for Armenian Studies at the Leucorea Foundation participants of the courses under the leadership of Hermann Goltz, doctor-professor of the Martin Luther University Halle-Wittenberg visited the Armenian Genocide Museum and Institute. Doctor Goltz is the director of the house-museum and archive of Johannes Lepsius. He is also honorary doctor of Yerevan State University. The participants of the summer courses visited the AGMI, where Hayk Demoyan, director of the AGMI, introduced them with the history of the Armenian Genocide. The guests put flowers to the memorial of the Armenian Genocide victims. The Khachkar dedicated to the memory of the Armenian Genocide victims in Budapest was desecrated by the unknown a few hours before the ceremonies of the 93rd anniversary of the Armenian Genocide. The vandals pulverized of black painting in this crowned day of April 24, 2008. In the back of the monument painting entirely covers the word "Genocide" engraved in Armenian. The word "Lie" is overwritten in Hungarian. The memorial was erected in Budapest in 2000. It's the first time that such an act of vandalism is perpetrated against the symbolic Armenian monument. The Armenian presence in Hungary goes up at 1000 years. Today is the day of commemoration of innocent victims of the Armenian Genocide. 250 Armenian intellectuals were arrested in Constantinople on April 24 in 1915 and were sent to Chankri and Ayash, where they were later killed. Today since early morning hundred of thousands of Armenians from Armenia and its vast Diaspora have been marching to Tsitsernakaberd Memorial Complex, Yerevan to remember all who perished 93 years ago during the Armenian Genocide. All brings flowers to the eternal fire, and a plenty of flowers encircles the area. The banners say "No more genocide, no more indifference, no more ignorance and no more denial". The President of RA Serge Sargsyan, Prime Minister of RA Tigran Sargsyan, Parliament Chairman Tigran Torosyan, Catholicos of All Armenians Karekin II, parliament and government members and diplomats were among the first visitors who remember the victims by visiting Tsisernakaberd Memorial Complex and laying flowers in the memory to the innocent victims. This short story was written based on an eyewitness account of Armenian massacre in Urfa in 1895. It was published in Cairo, in 1905 by A. Palyan. In the frames of this little story human honesty and kindness is mixed with the horrible episodes of human cruelty against human. It has strong psychological, emotional impact on readers. Hasan Amca: "That is all right, but who killed hundred of thousands Armenians"
This article was published in Turkish "Alemdar" daily in 1919 by Hasan Amca Turkish politician and eyewitness of the Armenian Genocide. The rhetoric and analysis of the text seems actually for our days and that is why it also could be regarded as an address to the current Turkish leadership. Hasan Amca wrote also memories on the Armenian deportations, which unfortunately is lost. After the end of the First World War Hasan Amca authored series of media publications in Turkish media on condemnation of perpetrators and denialists of the Armenian genocide during the court cases against the main organizers of the Armenian Genocide. The ceremony of memorial plaque dedication in memory of Jacob Kunzler, a Swiss missioner and humanist was held in Armenian Genocide Museum-Institute. 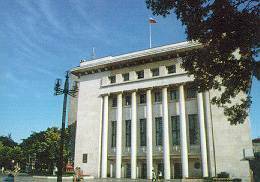 The event started at the "Komitas" hall of the AGMI, where a documentary film had been shown. Hayk Demoyan, the AGMI director, Ara Ghazaryan, chairman of the Armenian Cultural Foundation (USA) and the representative of Jacob Kunzler family, Pru Marshall made speeches. During the ceremony the official address of Swiss ambassador Lorenzo Amberg was presented by Zara Alaverdyan, the representative of the Swiss development agency's Armenian Branch office. The participants of the ceremony and Kunzler family members visited Tsisernakaberd Memorial Complex and put flowers to the Memorial of the Armenian Genocide victims. The annual press-conference of the Armenian Genocide Museum & Institute was held in the museum's Komitas hall. Hayk Demoyan, the director of AGMI, presented the main results of the AGMI activity during 2007-2008, which included: international cooperation, information about the new obtainments and enriching of the museum collection, particularly photos, old-printed books and albums, handwritten diaries and memoirs, other documents, publishing activities and others. During the press-conference the official web-site of the Armenian Genocide Museum & Institute and the virtual exhibition of the museum, made with joint efforts of AGMI and "Memco Soft" as well as, the new publications by the AGMI were presented. "And Those Who Continued Living in Turkey after 1915"
The Armenian Genocide Museum-Institute presents the book titled "And Those Who Continued Living in Turkey after 1915" by Rubina Peroomian, which issued under the auspices of the AGMI publishing-house. The book is about the Metamorphosis of the Post-Genocide Armenian Identity as Reflected in Artistic Literature. In the atmosphere of the precariousness of minority rights in Turkey and government's persistence in denying the existence of the Armenian issue as well as its continuing policy of pressure and selective approach to history, a prescribed national identity covering all ethnic groups in Republican Turkey was enforced and the Armenian collective suffering of the past was buried in silence. With the recent political developments in the world, the wall of silence is breached. The events of 1915 and the plight of the Armenian survivors in Turkey, be they Christian, Islamized, or hidden, are espoused and fictionalized in literature produced in Turkey. Einar af Wirsen was a Swedish Military attache in the Ottoman Empire during the First World War. He was an eye-witness of the Armenian genocide and had personal conversation with the main Turkish perpetrators and foreign diplomats accredited in Constantinople. The Chapter "The Murder of a Nation" is taken from his memories titled "Memories of Peace and War" published by Albert Bonnier Foriag, Stockholm, 1942. Eitan Belkind was a member of the NILI, a secret organization, which operated under Turkish rule in Palestine during World War I. After the Armenian massacres started, the main aim of the organization was to prevent the deportation and killings of the Jewish residents by the Turks. The UN Human Rights Council adopted the Resolution on "Prevention of Genocide" in Geneva. This was the first resolution on prevention of the genocide ever adopted in the UN Human Rights system. The Resolution is the continuation of Armenia's previous initiative in the UN in the direction of genocide prevention and is aimed at discussing the synchronization of the activity of mechanisms addressing the issue of early prevention, elaboration of the early warning signs, and the practical level of genocide prevention. The adoption of the resolution is characterized also with regard to the fact that this year marks the 60th anniversary of the International Convention on the Prevention and Punishment of the Crime of Genocide. This resolution that enjoyed broad support was co-authored by 58 countries, including all the EU member states, Switzerland, Austria, Argentine, Brazil, Canada, Mexico, Norway and others. On Wednesday, the Israeli Knesset, a parliamentary committee, will hold a hearing on the recognition of the Armenian genocide in the Ottoman Empire. The decision to hold a hearing, which was proposed by Meretz Chairman Haim Oron, was approved by a 12-MK margin. The Knesset House Committee will decide whether the issue will be handed over to the Knesset Education Committee, or to the Foreign Affairs and Defense Committee. The Meretz MK added that he raises the proposal every year ahead of Armenian Genocide Day, which falls on April 24. Minister Shalom Simhon, who represented the government in the Knesset debate, said the Jewish people have a special sensitivity to the issue and a moral obligation to remember tragic episodes in human history, including the mass murder of the Armenians. "Truthful and striking documentary on the Armenian Genocide"
The "AOKS" (Armenian Republic Organization Cultural Corporation with Foreign Countries) presentation of the book "Aram's Diary" by the Catalonian poet and rhymester, Maria Angels Anglada's (1930-1999) took place today. Maria Angels served as professor of classical philology at the Secondary College in Barcelona. First published in 1997, "Aram's Diary" was her last expanded work, which was written based on personal notes, historical testimonies, documents, and literary works provided by mother and son survivors of the Armenian Genocide. The novel had a great reaction in Catalonia and then in Spain; it received the highest commendations by the media and critics have unanimously called it a "truthful and striking documentary on the Armenian Genocide". Because "Aram's Diary" is based on historical facts and the heroes convey real emotions, the read becomes both exquisite and friendly. Yerevan, Armenia--On March 13th, 2008, the Information Administration and Public Relations Office of the Armenian Government decided to provide the Ministry of Agriculture with 21 million drams from its reserve fund, intended to rebuild and develop the forests of the country, particularly in Yerevan area. This plan also encapsulates the realization of restoring the vegetation surrounding the 98 hectares of land of the Tsistsernakaberd Memorial Complex. Armenian Prime Minister, Serge Sargsyan stated, "this State money is provided in accordance with the laws directly applicable to the Republic of Armenia's (RA) Budget System". Last year, on September 8th, the Prime Minister visited the Armenian Genocide Museum & Institute (AGMI), Tsitsernakaberd Park. Prime Minister Sargsyan was reacquainted with the main issues in and around the vicinity of the Tsitsernakaberd Memorial Complex. Outstanding Jewish Genocide Scholars prof. Yair Auron, prof. Israel W. Charny and prof. Elihu D. Richter wrote an open letter to Tzipi Livni, Minister of Foreign Affairs of Israel, expressing their irritation on the announcement of Gaby Levy, Ambassador of Israel to Turkey that, "What we [Israel] realized in Gaza, was not a genocide just like the way it was not a genocide carried out against Armenians". The ambassador of Israel to Turkey has made suchlike speech when Erdoghan, Prime Minister of Turkey, strictly criticized Israel's attacks on Gaza. 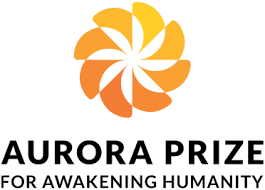 Below we represent open letter of the outstanding Jewish Genocide Scholars. His Eminence Tarcisio Cardinal Bertone secretary of state of Benedict XVI Pope of Rome visited Tsisernakaberd Memorial Complex. During the visit guests put a wreath to the memorial to the Armenian Genocide victims. His Eminence Tarcisio Cardinal Bertone also planted a fir at the Memory Alley. On the state, which was putted near the fir, was writhed "May the Lord bless the memory of the righteous and grant them eternal rest". Secretary of state of Benedict XVI Pope of Rome accompanied by the other clergymen also visited the Armenian Genocide Museum. His Eminence Tarcisio Cardinal Bertone left a note in the Commemoration Book: "With great faith I pray high on the behalf of the Benedict XVI Pope of Rome. With warm regards I wish that this will never take place. Long life to the Armenian heroic nation!" The city community council of Stara Zagora, one of the biggest cities in Bulgaria, has recognized the Armenian Genocide carried out by the Ottoman Empire in 1915. The RA MFA press office reports the motion passed with 28 votes "for", 2 "against" and 10 abstentions. We remind several days ago the Armenian Genocide was recognized by the city Burgas. According to information from the Foreign Affaires of RA city council of Bourgas in Bulgaria adopted a special resolution on the recognition of the Armenian Genocide with overwhelming majority of votes (43 for, 2 against). The principal points are the recognition of the Armenian Genocide in 1915, obligation to the Municipality of Bulgaria to adopt April 24 as a memory day of the Armenian martyrs and the demand of the National Assembly of Bulgaria to recognize the Armenian genocide. The Armenian Genocide Monument was desecrated on a symbolic day designated to recall the events, consequences and lessons of the darkest days of human history in a deliberate and premeditated act of vandalism. The Armenians and the Welsh gathered to pray for victims of all genocides on the United Kingdom's Holocaust Memorial Day and to remember the first anniversary of the assassination of Hrant Dink, the journalist killed for raising the issue of the Armenian Genocide in the Turkish press. The small Welsh Armenian community found that the ornate slate cross on the monument was smashed into pieces with a hammer left at the scene.The ceremony went ahead. One of the Welsh Armenians said "This is our holiest shrine. Our grandparents who perished at the Genocide do not have marked graves. This is where we remember them". 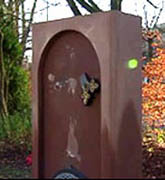 Remanding of the historic consecration of a Khatchkar has taken place in Cardiff on November, 2007. On January 19, Hrant Dink, the editor of the Armenian-Turkish Language the weekly magazine "Agos" and a well-known commentator on Armenian affairs, was shot outside his office. The murdered journalist Hrant Dink was one of the most prominent figures of Turkey's shrinking Armenian community. The reasons of his assassination still are in the process of investigation. Day by day appears totally new detections connected with the assassination of Hrant Dink. On the occasion of the anniversary of his death, the Armenian Genocide Museum-Institute presents an exclusive interview with Hrant Dink before his tragic death. In Bethlehem, U.S. President George W. Bush was reminded about the Armenian Genocide. After talks with Palestinian Authority President Mahmoud Abbas, Mr. Bush attended Chapel of the Nativity of Christ and met with Primate of the Jerusalem Diocese of the Armenian Apostolic Church, Archbishop Aris Shirvanyan, who raised the issue of the Armenian Genocide. The territory of Chapel of the Nativity of Christ is divided into three parts: the Armenian Apostolic Church, Roman Catholic Church and Greek Orthodox Church. Welcoming Pres. Bush on behalf of the AAC, Archbishop Shirvanyan reminded Mr. Bush that Armenians were the first nation to adopt Christianity as state religion and requested the U.S. President to reconsider the Armenian Genocide recognition issue. Mr. Bush said he spoke about the issue with Turkish President and is thinking over it, RFE/RL reports.